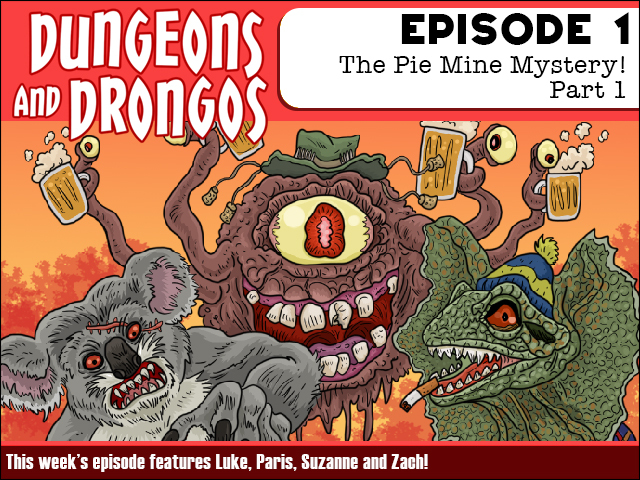 Fruitless Pursuits: Dungeons and Drongos Episode 1: The Pie Mystery Part 1! Dungeons and Drongos Episode 1: The Pie Mystery Part 1! G'day and welcome to the very first episode of Dungeons and Drongos! A brand new podcast where four bonza mates play Dungeons and Dragons in Fantasy Australia - where absolutely everything wants to kill you! Filled with dropbears, dunnies, dropkicks and dingledongers, this brand new adventure series features Dungeon Master Luke (The Book Was Better, FPcast) tormenting a heroic party of Suzanne, Paris and Zach! Start right here at the very beginning of our first epic adventure... The Pie Mine Mystery part 1! Good call! Let me try to sort this out. Plank's other names aren't Thick-as or Two-short?